WWW.TIESPLANET.COM - The Blog: Has Ricky Hatton Been Reading This Blog? Has Ricky Hatton Been Reading This Blog? Much smarter, we are sure you will agree. 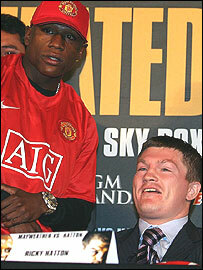 Hatton was in Manchester, again promoting his fight with Floyd 'Pretty Boy' Mayweather. Ricky Hatton or David Beckham?